As mentioned in previous posts, the main character in Creating Esther is an Ojibwe girl who goes to an Indian boarding school in 1895. The practice was to “civilize” the students by giving each of them a traditionally white name. So I had to find two names for my protagonist—an Ojibwe name and a “white” one. One way that superintendents and teachers chose white names was to compile a list from the Bible and assign the next one. Running through some Biblical names in my head, I settled on “Esther” because it just sounded right. But there was another reason, as well. By the end of the book, my protagonist has made some decisions that put her on the path to saving her people, which is what the original Esther did. My Esther will do it less dramatically and as one of many forces, but the concept works. Coming up with an Ojibwe name was more challenging. I started by going to one of those baby naming websites and looking for Ojibwe girls’ names. 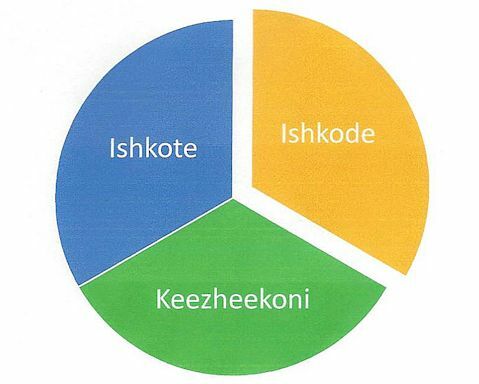 I liked “Keezheekoni” because it supposedly means “burning fire,” and my protagonist has a fiery temperament. Unfortunately, based on the sources I found, it appears to be hard to pronounce. There was an even bigger problem. While most of the baby name sources list it as a Chippewa name, a couple list it as Cheyenne. Worse, I couldn’t find any of its roots in either A Dictionary of the Ojibway Language by Frederic Baraga or A Concise Dictionary of Minnesota Ojibwe by John D. Nichols and Earl Nyholm. So even though I liked the look and the purported meaning of “Keezheekoni,” I ended up rejecting it. But the meaning worked well for my story, so I checked both dictionaries for the Ojibwe word for “fire.” Father Baraga’s dictionary listed “ishkote,” while the more modern one used “ishkode.” One letter different, but which is correct? They probably both are. Ojibwe was originally a spoken language with no written equivalent, and the people who tried to write it down used various spellings. In Red World and White: Memories of a Chippewa Boyhood, author John Rogers says that his new baby brother was named Ahmeek, meaning beaver. But the Concise Dictionary spells beaver a-m-i-k. In the end, I decided to go with the more modern spelling and name my protagonist Ishkode. It wasn’t an easy choice, but names matter. As writers, we are always looking for advice to make our writing jump off the page and into the reader’s imagination. The writing book I’m want to talk about this month is not a writing instruction or advice book where you will find information about plot twists, characters, or how to revise your book. I came across this in grad school when I wanted to figure out how to pump up my writing and make it more sophisticated. 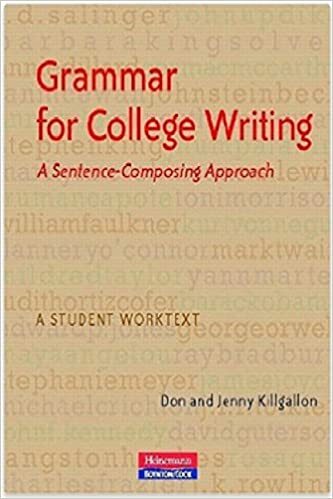 Grammar for College Writing by Don and Jenny Killgallon is a great resource for anyone who wants to improve their sentence writing ability. How could a book that quotes J. K. Rowling, author of the famous Harry Potter series, who is a master at creating details with her sentences be bad? I knew that I loved the Harry Potter series, but I never actually focused on how she constructed her sentences. After doing the first section in Killgallon’s book, Noun Group: The Naming Tools, I was hooked. They take simple grammatical words like appositives, gerunds, infinitive, and noun clauses and shows how to expand the sentences using these grammatical devices. She starts each section defining what each term means with at least three different examples from classic literature. Then the review section is usually pretty big. First, you will exchange sentences by switching up the infinitive or gerund with something closely grammatically related. Then you will practice expanding by adding an infinitive phrase or gerund phrase to the bold face section. There is matching. Multiple choices. More practice. It really helped me to improve my sentences. While I was teaching college at Indiana State University in their English department, I would throw in some grammar on Fridays. Some of the exercises were from this book. I would start the exercise with taking apart one of Rowling’s well-written sentences and make it flow as a simple sentence: He ran. Sweat poured. Foot hurt. After putting the sentence back together, they learned how much better a variety of sentences in our writing can flow better. As much as I enjoyed improving my sentences, I believed my students didn’t like it, but I showed them how richer than writer can be by using these simple tricks. This is a great book if you want to learn how to make your sentences have more variety. I also suggest looking at J. K. Rowlings famous series and observe how her sentences just flow off the page. Do you enjoy learning how to grammatically better your sentences better? As a writer, grammar should be important to our lives as much as the creating of our stories. Come hear Laura Frantz speak in November! 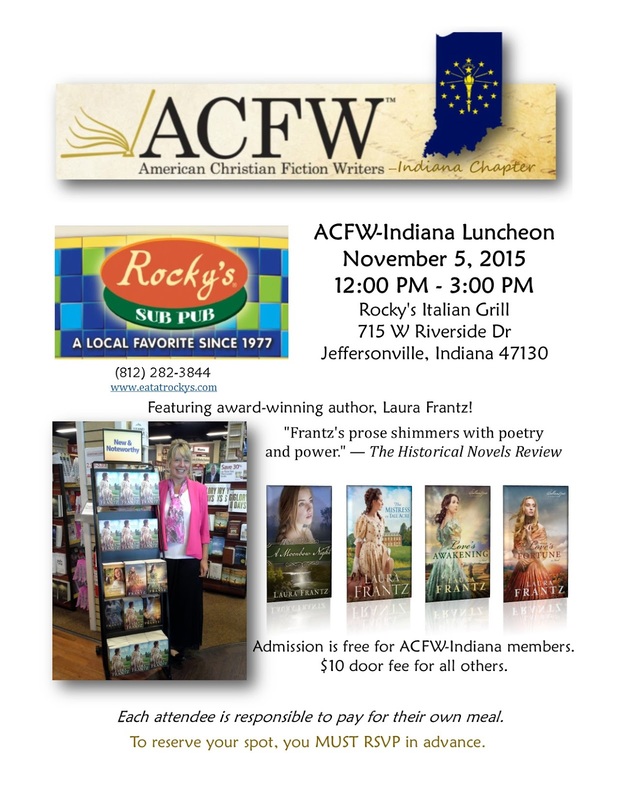 I'm so excited about our upcoming ACFW-Indiana event! I hope you'll RSVP and join us! Check out this video of how one of her book covers was made. LOVE it!